Learn the skills you need to become a Medical Administrative Assistant — at home, at your own pace, with Penn Foster Career School International. As a Medical Administrative Assistant, you’ll need to know medical terminology, managing and updating patient records, and office procedures. The Penn Foster Career School program can help you learn these skills and many more affordable, quickly and conveniently. And you’ll learn it all at home — no classroom needed. Work for a hospital in admissions or assist administrators. 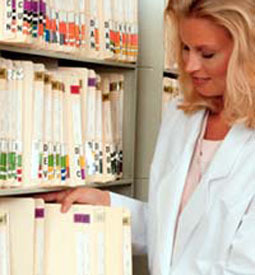 Work for insurance companies processing claims and verifying billing. Work for Public Health Organizations for federal, state, or local government. Demand for Medical Administrative Assistants will rise nearly 34% through 2018. * Medical Administrative Assistants enjoy exciting, varied assignments, steady work schedules, respect and prestige. Whether you work for a clinic or doctor's office, as a Medical Administrative Assistant you’ll have a career you can be proud of! Get more information today and in as little as one year from enrollment, you can be on your way to a career as a Medical Administrative Assistant.